The word luxury gets bandied about so often these days that it’s lost much of its impact and meaning. Manila-based designer Jonathan Matti, however, knows the true meaning of the word, and that it doesn’t refer to anything ‘that can be found in a department store,’ as he often quips. According to the designer, true luxury is something that is hand-made, bespoke, unique. It’s for this reason that Matti often specifies custom de Gournay wallpaper in the homes he decorates for the upper echelons of Filipino society. The British wallcovering company de Gournay was originally founded in 1986 by Claud Cecil Gurney, who purchased a few panels of antique Chinese export tea-paper at auction and was looking for a way to restore and replicate them. Gurney’s mission took him to the source, and after touring studios and factories in China he decided to create the company (named after the original spelling of the family name). Over the following decades, de Gournay has built a solid reputation for providing high-quality, hand-made and highly customisable wallcoverings based on the traditional chinoiserie patterns and scenic landscape panels that were originally created for some of England’s most stately manor homes. 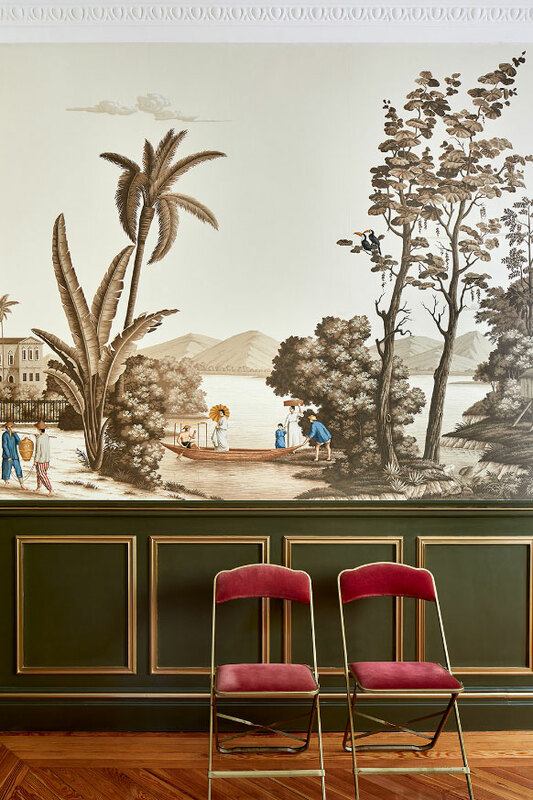 Over lunch, after meeting Matti for the first time serendipitously at Decorex, Jemma Cave — de Gournay’s design director — ‘popped the question,’ as Matti says, inviting the designer to partner with them to create a new panorama design based on his native country. The collaboration was unprecedented for the company. Matti, initially put off by his admitted lack of drawing skills, eventually agreed, knowing that Cave shared his vision. What he may lack in drawing skills, Matti more than adequately makes up for with his encyclopedic knowledge of Filipino culture, design and art. The designer shared visual references from his own library with Cave, and after more than two years and several trips back and forth between Manila and London, Latina Manila was launched at Elements, de Gournay’s distributor in the Philippines, last month. Made up of 20 individual panels, the panoramic design illustrates a bustling scene of the Philippine islands — Chinese traders, farmers and landowners all going about their days under palm trees that sway in the tropical breeze — depicted beautifully in colours reminiscent of fading light. An effect perhaps symbolic of a faded grandeur, the scenes are evocative of a bygone era, a time when the Philippines was one of the wealthiest countries in the region and under Spanish rule. The design is an amalgamation, or a pastiche if you will, of a variety of elements of Filipino flora, fauna and colonial architecture. While not all the designs are historically or geographically accurate, they are the result of Matti’s exuberant imagination — and it’s about time somebody drew on the rich culture and heritage of the Philippines for inspiration.